Please note: All the email addresses chosen to illustrate this article are fictional. Imagine you’re looking for a wedding photographer online. You want to find a reputable professional who you can rely on and, after scrolling through numerous websites you finally decide on the one you want to contact. It all looks perfect until you read “Email me at sarah.babe.xoxo@hotmail.com“*. Next, consider meeting somebody at a business networking meeting. You want to hire a PR professional, for example, and the person you are talking to ticks all the right boxes. Then, he hands you his business card and tells you to get in touch at footballFREAK1987@yahoo.com. Unprofessional email addresses ruin the credibility of a business. You wouldn’t wear Bermuda shorts for a meeting with your bank manager or tell the Board of Directors the suggestive nickname you earned in Ibiza. The email address steve.kelly@car-valeting.org incorporates the business’s brand name; people who see your contact details can even make an educated guess about the URL of your website. Giving out your email address becomes an indirect way of promoting a company’s web address, whereas using car-valeting@gmail.com gives potential customers no indication of where they can find you online. A professional email address creates an air of authenticity. Using SEOspecialist147@yahoo.com, on the other hand, simply does not convey trustworthiness. 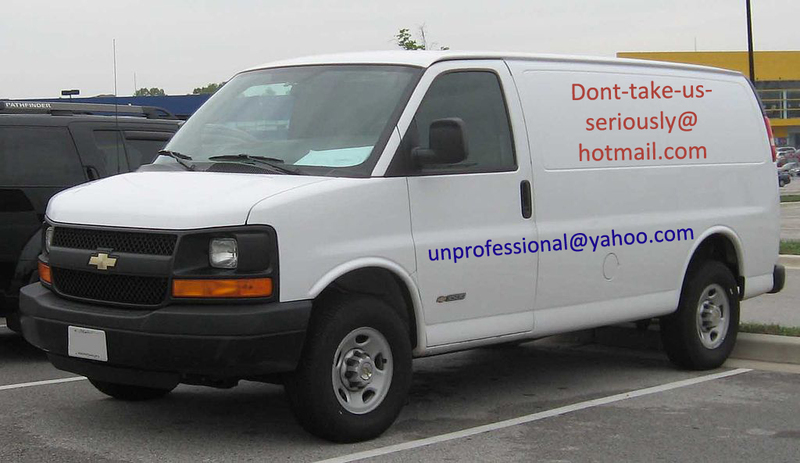 Consumers look for indications that an online business is legitimate before handing over their cash or sharing a web link with their friends so, if you have a well-presented website with authoritative information and an appropriate domain name, don’t let yourself down with a questionable free email address on your contact page. Find the right domain name for your email address LCNs Domain name checker. Professional email addresses are easy! The benefits of using professional email addresses are immense and it is easy to set up custom email accounts when you purchase a domain or manage your web hosting account. Email accounts can then be easily managed on the web, using software like Thunderbird and Outlook, or on gadgets like iPhones, Android devices and Blackberries. Alternatively, emails can be auto-forwarded to a service of your choice. Get your business email address online with LCN – take a look at their range of business-ready email hosting options and save 10% with promo code LCNBLOG10. If you have any questions at all about getting a professional get in touch with us in the comments below, or drop us an email.